Artists have created cat art, or at least artistic pieces that include or feature cats, in Asia, Europe and the USA, over the centuries. Throughout history, people have responded to cats in various ways...sometimes idolised, sometimes detested. 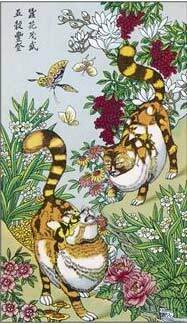 Oriental artists have regarded the domestic cat highly for centuries. The concept of cat breeds is a Western phenomenon, starting in Britain in the 1800s. Asian artists, however, were influenced by the cats that surrounded them. 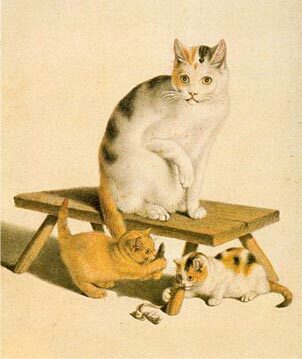 Japanese artists often portrayed bobtail cats, and tortoiseshell and white cats, which was a common coat pattern there. The Magic cats of China depicted to the left are magical spirit-cats who stop the rats from eating the precious silk-worms by Mary Evans. Cats started to appear in European art in the 18th century, despite the Christian Church's disapproval and stigmatization of them. European masters such as Leonardo Da Vinci and Pierre-Auguste Renoir featured cats in some of their works. Katzen by Swiss artist, Gottfried Mind.